Gifts from the Pirates: "Childhood is the sleep of reason." Opeie's new favourite role playing activity in the house is making a bed for his toys and making sure they are comfy and tucked up. It seems that any time of the day is appropriate and once they've got their heads down they are expected to stay there for quite sometime. I can't help but think 'why has he not taken a leaf out of his play routine and opted to sleep through the night?' Spider-Man doesn't seem to have a choice. Opeie has never slept through the night and many nights end up being a constant battle......... For Mrs M haha. I'd love to help but my lack of the mammary gland and the fact that a brass band could walk through our room and I wouldn't wake up makes it virtually impossible. With enough kicking though I have been known to open a window, plug the fan in and get Opeie medicine when he's ill so I'm not all bad and i do get up in the mornings early so Mrs M can have a catch up. Hopefully Opeie will start sleeping properly soon but the fact that he is such a boobie monster is the main problem (wonder where he gets that from?). Maybe if Opeie keeps making beds around the house for his toys eventually he will realise the importance of sleep. 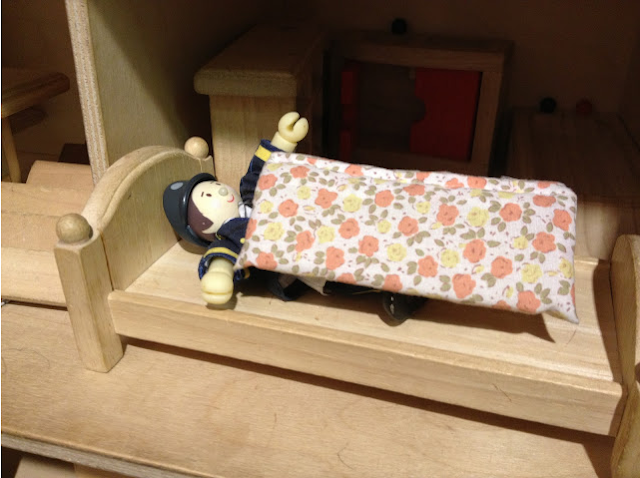 He even puts toys to bed when were out and about last week at the toy museum he took the cushion off a sofa in the dolls house and tucked the postman in. Mrs M had an old new born crib that we had been using as a magazine rack since we moved in so we emptied it, made a mattress and looked for suitable bedding for Opeie's favourite super hero. I found a little patterned pillow from Ikea for him and put it in and Opeie looked at me with a really disappointed face then removed said cushion. I couldn't work out why he seemed so annoyed until he came bopping across the room clutching his spider-man head cushion (silly daddy). I'm really loving how he knows what he wants and is quite independent. I thought his little bed was complete but Opeie had obviously gone in to dad mode and knew what was best for his new little boy. Turns out that Spider-man doesn't get a decent nights sleep unless he's wearing a pair of safety goggles, I'll have to let Mrs M in on that little tip. I love Spiderman's sleeping goggles, very cute! !